Walter and Cathy Earley are part of a history of family farming on this 100+ acre parcel, following in the footsteps of Walter’s father who worked the land since 1948. 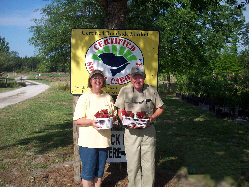 Following retirement as a Department of Agriculture Conservationist, Walter and Cathy decided to open their business as a retirement hobby and family project. Married in 1969, Walter and Cathy have two children(Chris and Karen); a granddaughter (Lauryn), son-in-law (Michael), grandson (Bryce) and a husky named Hank who all help with the growing family operation. The Earleys’ are dedicated to growing and promoting South Carolina products.